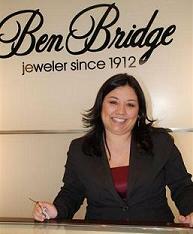 I have worked for Ben Bridge in Dos Lagos for two and a half years and I am the store’s assistant manager. Our crew here is fantastic; in fact, I would bet that we are the best team of jewelers in the country! We are all creative and talented in our own ways. I recently received my AJP (Accredited Jewelry Professional) from the Gemological Institute of America and I have a Bachelor’s Degree in sociology that I received in 2008 from California State University in Fullerton. I have also volunteered in several organizations in the community that help women find jobs and provide services to help them get back into the work force. In addition, I have done some tutoring for students who need help with math. As you can see, I love to work with all different types of people from diverse backgrounds. I am married and we have a beautiful three year old daughter. I have a busy life and I love it! When I am not at work, you may find me trying to find new places to take my daughter. Whether it is the park or the zoo, I love to keep her entertained. I have always loved the combination of rose gold with smoky quartz and that beautiful combination of colors together inspired me to create this design and enter the competition. I wanted something that was substantial in size and I knew that it had to be done in rose gold. In order to make it even more distinctive, I dressed it up by adding diamonds around the two gemstones. I think it has an expensive look at an affordable price. 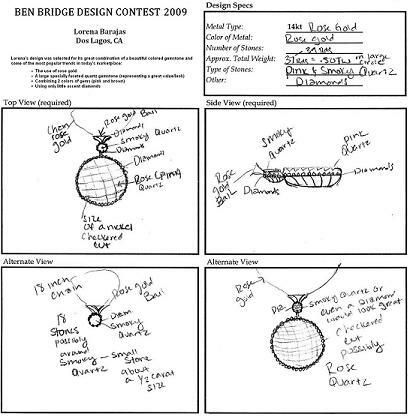 I am very proud to say that I work for Ben Bridge. This company has given me the opportunity to try new things, from designing a piece of jewelry to taking courses that have provided me with the proper knowledge to become a professional jeweler. That’s something you won’t find anywhere else. I hope you love my design and I can’t wait to hear what you think when you see it in person.